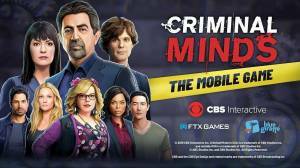 Criminal Minds: The Mobile Game is based on the long running CBS TV series that follows a team of behavioral profilers who work for the FBI as members of its Behavioral Analysis Unit (BAU). The team focuses on profiling criminals, called the 'unsub' or 'unknown subject', as well as victimology, in investigation of crimes. Each member of the team brings his or her expertise to pinpoint predators' motivations and identify emotional triggers to stop them. 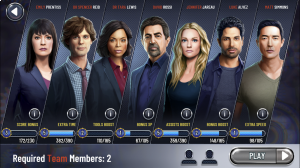 Criminal Minds: The Mobile Game puts you at the centre of a series of murder scenes and with the help of the BAU team, which comprises of agents Rossi, Prentiss, Reid, J.J., Garcia, Lewis, Alvez, and Simmons you must analyise the crime scene and look for clues that will help you capture the serial killer before they can strike again. As well as investigating complex crime scenes you will need to immerse yourself into the mind of the Unsub to solve the question of who will be their next target. This will involve replaying levels to unlock different play-through experiences while trying to earn a maximum score of 4 badges per each level. Each Agent analyzes crime scenes in their own unique manner so make sure you experiment with different Agents when analyzing evidence. Each of the Agents has their own set of sub-stats which you can use to determine how much of a bonus you have a chance at earning for a specific Agent. The bonuses the different Agents posses include Emily's score bonus, Dr Tara’s tools boost, and David’s bonus experience. To see the stats of an Agent tap on 'I' for the info button. As Agents increase their level, their sub-stats increase, so the bonus you get for using them on a level increases. While analyzing crime scenes there will be certain evidence you can zoom in on and you will be able to uncover the truth by completing minigames. Remember that once all the steps are complete you need to tap the coin to collect the points you have earned and close the Task. Each step of a Task has a timer that will run out. Make sure you start steps within the allotted time to increase the combo counter, multiplying your score. If you can complete multiple Tasks in a row, before their timer runs out you will be able to score extra points. You will also be able to earn extra points by completing chapters quickly. The more time left on the clock - the more bonus points you will earn. You will be able to perform most Tasks faster by tapping and holding them. Once you have completed a chapter you will be able to replay it with or without story. Replaying a chapter without story allows you to choose which Agents will work the scene. Each Agent has unique skills and provides benefits to the team. Agents' skills and experience will improve the more they work. It is recommended that you experiment with different teams compositions so you optimise your strategy and score. You can watch the story again on an old level by tapping on the 'Show Story' button which appears blanked out for all of the old levels. It will however turn green when selected and allow you to see the story. On new levels, you can't gray out the 'Show Story' button, but if you want to skip a story, just hit the 'Skip' button as soon as the story pops up to move right past it. The Garcia Coins icon is the icon that looks like a revolver chamber in the lower left corner of the 'Level Select' screen. If you tap on this coin icon which Penelope is standing behind it you will be taken to a decorations menu where you can use the coins you earn during the game to purchase various cute decorations for Penelope’s desk. Some are cheap, such as the cactus and the sunflower, while some are extremely expensive.